ANITA YOUNG is a painter of the natural world based in Cheshire, England. She was born in Blackburn, Lancashire in 1956. She has lived in the village of Stockton Heath with husband Andrew since 1985 and works from her studio at Higher Whitley in the heart of the beautiful Cheshire countryside. Anita’s work is influenced first and foremost by her deep love of nature. Specialising in wildlife, she celebrates the beauty of the natural world through the medium of pastel, focusing primarily upon mammals and birds. Her aim is to depict the essence and the spirit, as well as the visual reality, of her subject in as fine a detail as her chosen medium will allow. Anita’s lifelong interest in natural history, animal behaviour, world cultures, folklore and philosophy all combine to strongly inform her choice of painting themes. Anita has an all-consuming passion for wolves. She is a dedicated advocate for wild wolf conservation and promotes the cause at every opportunity through her painting, workshops, demonstrations and talks. Anita supports, both personally and by way of proceeds from sale of her work, several UK- and European-based organisations who help fund wolf conservation projects around the world and who educate the general public about wild wolves, their true nature, behaviour and habitat, and about the challenges that they face, especially in areas of the globe increasingly overtaken by human habitation, agriculture and industrial development. 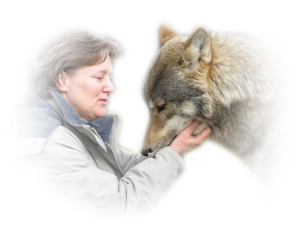 Anita’s passion for, and knowledge of, this magnificent creature as her primary painting subject is fed by ongoing self-study, live observation whenever possible, and frequent visits to workshops and seminars – most notably at the UK Wolf Conservation Trust in Berkshire, an organisation which works tirelessly in the cause of wolf conservation. She has also completed courses in wolf behaviour and welfare run by Shaun Ellis’s WolfPack Management Team in Devon. Anita also supports Wolf Watch UK, a small but dedicated wolf rescue centre committed to wolf welfare and education. “I feel blessed to have been bestowed a gift which enables me to express my love of nature, and especially privileged to be able to use that gift to help contribute in some small way to the cause of conservation. For me the wolf has more than fulfilled its ancient symbolic role as teacher and pathfinder. It has helped me to find my voice – for which I owe the wolf an eternal debt of gratitude”. Anita arrived at the profession of wildlife painting via a rather unconventional route, leaving behind a 20 year career in business in the year 2000 to study canine behaviour and animal welfare, and also embarking upon a journey of re-discovery of long-neglected creative talents. She, quite literally as well as metaphorically, went back to the drawing board, attending a diverse range of arts and crafts courses until, one day, something of an artistic epiphany occurred . . . . She found her ideal medium, pastel pencils, appropriately enough whilst painting the portrait of a WOLF on an Animal Portrait Painting course in 2004! Anita continued to learn from professional wildlife artists whose teaching, mentoring and encouragement have been invaluable in her artistic development, and ultimately in her decision to set up PAINTED FEATHER STUDIO as her working base at the beginning of 2010. 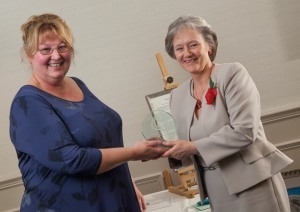 The studio is now located in the village of Higher Whitley, Cheshire, from where Anita paints and teaches. Whilst gradually developing her portfolio of original work, Anita takes private commissions for paintings of both wild and domestic/companion animals. 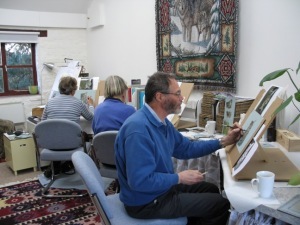 She presents demonstrations and workshops to local art groups and offers tuition at Higher Whitley through her programme of ‘Painting Nature in Pastel Pencil’ courses. Her most recent project has been to begin the creation of a series of narrative paintings exploring some of the challenges facing the natural world today – ‘Pictures of a Thousand Words’. The first painting in this series is a composition entitled ‘Glowing Embers of Ice’, released as a Limited Edition Print in October 2014, and featuring arctic wolves. 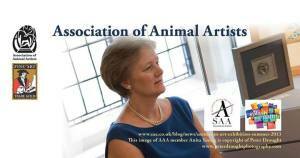 Anita is a member of the Association of Animal Artists and in November 2014 became the first recipient of the Association’s Inaugural Chairman’s Award for her work in raising the profile of animal art and wildlife conservation.